If you’re a runner, you might be familiar with the term ‘negative splits’. It refers to running the second half of a race at a faster pace than the first. It’s a strategy many runners pursue, since it’s considered to be one key to faster overall times. I was contemplating this concept a few weeks ago after I had the unplanned fortune to run a negative split during a 10K trail run. As a woman of a certain age, I thought how this concept might be applied to life. You see, I’m not just approaching middle age. I’m firmly and fully in the midst of it. There’s a time, maybe in your late thirties, where you can stave off the notion of middle age. I mean, 70 is the new 50, so surely 35 isn’t considered middle age. Then 40 comes, and you think, well, 80. Eighty’s not so bad. But a few years in to the decade, you really can’t ignore it anymore. You’re there. Halfway through, perhaps more. Deal with it. One way I want to deal with it is with this idea of negative splits – but not regarding time. I certainly don’t want the second half to go faster than the first (although I suspect it may feel that way). But from a performance standpoint, what a great idea. I want the second half to be better, more focused and intentional than the first. There’s a sense of not wanting to be wasteful with my time. This is usually what I’m thinking about while I’m binge-watching missed episodes of The Good Wife on Amazon Prime. Clearly, I still have some work to do. And that’s kind of the point. I do still have things I want to do, things I want to explore, experience, and discover. I want to keep thinking that’s the case and not let time just drift by. As a child, I recall relaxing on a raft in the ocean, eyes closed, not concerned about much until I woke with a start to find that the currents had moved me far from where my family was on the shore. It sure could take a lot of effort and time to get back to where I wanted to be. Drifting isn’t all bad. Sometimes it’s a path to finding something you never even knew existed. I’ve done a fair amount of that thus far, and thankfully most of my drifts have led to positive results. But I know myself better now and suspect that mindless drifting is unlikely to lead me to the finish line, arms raised, smile on my face, satisfied with my life in negative splits. Are you approaching midlife? Perhaps wondering if you’re already there? We all arrive at it in our own way – some with a whimper and some with a bang. Midlife’s a natural time (although it can feel quite unnatural) to pause and take inventory. It’s what you do with the results that makes all the difference. Gone are the days of the garden variety midlife crisis. You know the ones – men frequenting the gym, getting highlights and fake tans, and buying overpriced cars in fire engine red. When I was growing up, it seemed the midlife crisis was the singular domain of the middle-aged man. But times have changed. Equality between men and women may not be all the feminists had hoped, but one thing is clear – when it comes to a midlife crisis, we’re all entitled to one. Use these three tips to plan for its success. When you start to hear the rumblings of your crisis approach, don’t let the discontent or questioning have you jettisoning all that’s good in your life. 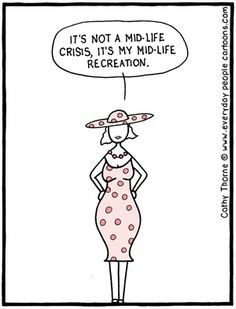 Midlife isn’t a ‘do over’. You don’t get to act like the last 40-ish years of choices didn’t happen. Not without consequences anyway, and the last thing you want is to become one more cautionary tale. That pile is deep and wide. We often find in midlife that the things we charged so hard at in our 20s and 30s haven’t brought as much fulfillment as promised. Or maybe they did for a while, but now that’s started to wane. Midlife is a chance to set new intentions, to match long-held desires with decades of experience. Changing course should be a gentle shift. Be kind to yourself, your past, and those around you. A midlife crisis is like going on walkabout, a sort of vision quest, a rite of passage that leads back home. Make sure the door’s still open when you get there. So how do you know what might satisfy your itch? One way is a bit of advice I heard from one of my favorite podcasts hosted by Gretchen Rubin and Elizabeth Craft. In the eighth episode of their podcast “Happier”, Rubin and Craft suggest that asking yourself what you did for fun when you were 10 years old is a great way to find what might make you happy now. They don’t discuss it in the context of a midlife crisis, but why not? Your crisis is about change, changes to make you happier, more fulfilled, content. Perhaps you loved to dance when you were 10, but didn’t keep up with it as the years passed. Or maybe you loved climbing trees, playing tennis, or listening to music. These are things that can be re-imagined as adult activities – especially climbing trees. Take it easy out there. No crisis is worth a broken hip. Picking up a new hobby is a great way to channel youthful thoughts. When was the last time you took a lesson, tried a new sport, or went back to doing something you loved as a child? At some point, you probably moved from student to teacher, whether in your home, your profession, or both. It’s time to take a step back and play student again. Learning something new in middle age can be energizing and invigorating – challenging too, perhaps, but knowing you aren’t an old dog quite yet will do wonders for your view of the future. Be brave. Introduce changes slowly. Remember what it’s like to dream again. Did I mention be brave?